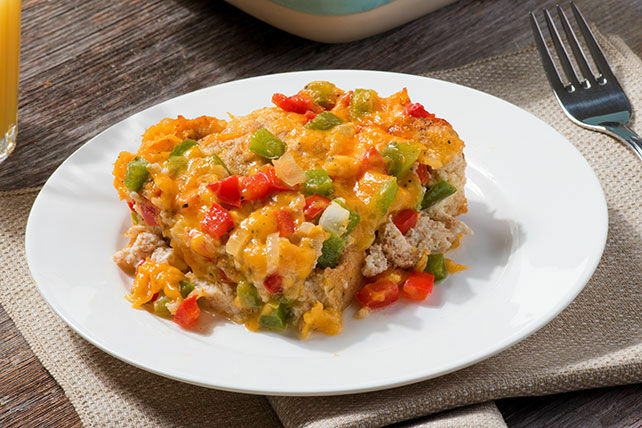 Studded with whole wheat bread, onions and colourful peppers, this cheesy egg casserole is sure to transform your morning into a little fiesta. Cook vegetables in medium nonstick skillet on medium-high heat 4 min. or until crisp-tender, stirring occasionally. Place in large bowl. Add egg product, milk, cheese and seasonings; mix well. Place bread in 2-L casserole dish sprayed with cooking spray; top with egg product mixture. Bake 45 to 50 min. or until knife inserted in centre comes out clean. For a spicy kick, prepare using Cracker Barrel Shredded Light Tex Mex Cheese.